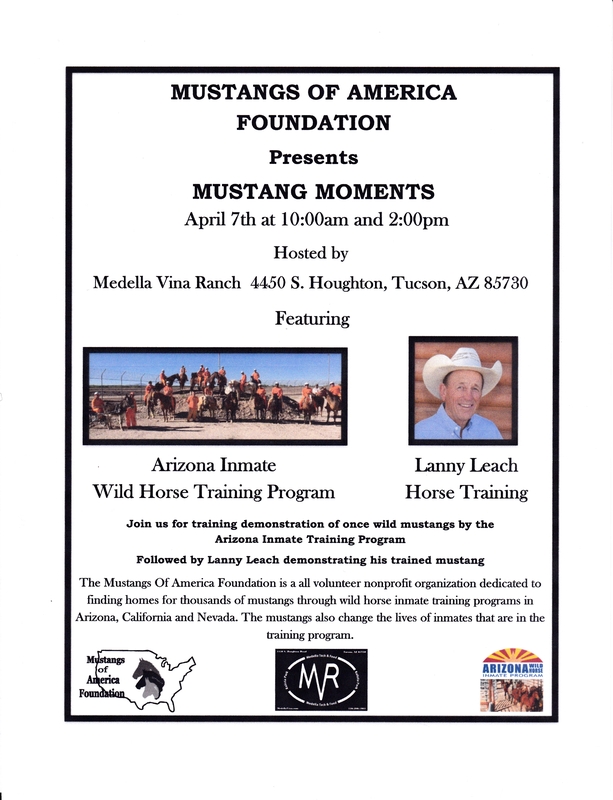 April 7 - 10:00 a.m. and 2:00 p.m. "Mustang Moments" at Medella Vina Ranch, 4450 S. Houghton Road, Tucson, AZ. 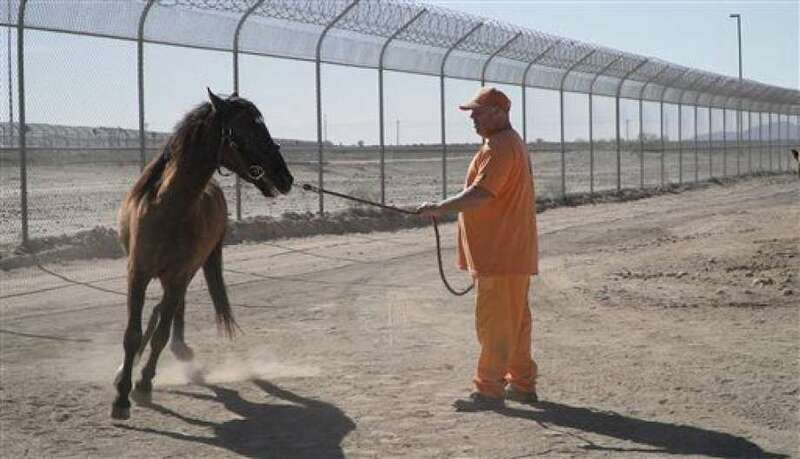 Watch a training demonstration of once wild mustangs by the Arizona Inmate Training Program. Lanny Leach will show how his training techniques are used in the program to gentle the Mustangs. Here are a few clips of Lanny working with Inmates at the Florence Arizona Prison Complex. Lanny Florence Prison Training 1 and Lanny Florence Training 2. See the Mustang Moments flyer HERE. Visit Lanny Leach Horsemanship on . April 21 - 23 - Verde Valley Horse Festival, Cottonwood, AZ. As the 2013 Arizona Horseman’s Challenge Champion, Lanny has been asked to return as a judge and clinician for the 2017 Horseman’s Challenge in Cottonwood, Arizona. 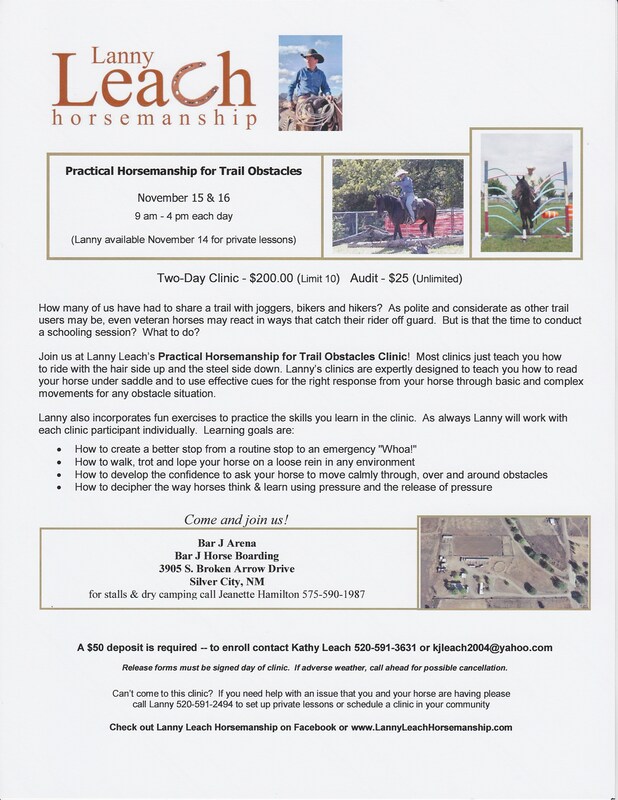 Lanny will be in the "Ride with the Experts Clinics" conducting a clinic on Trails and Obstacles on Friday and Collection and Lateral Movement Preparing for Cowboy Dressage on Saturday followed by a demonstration on Cowboy Dressage to music. 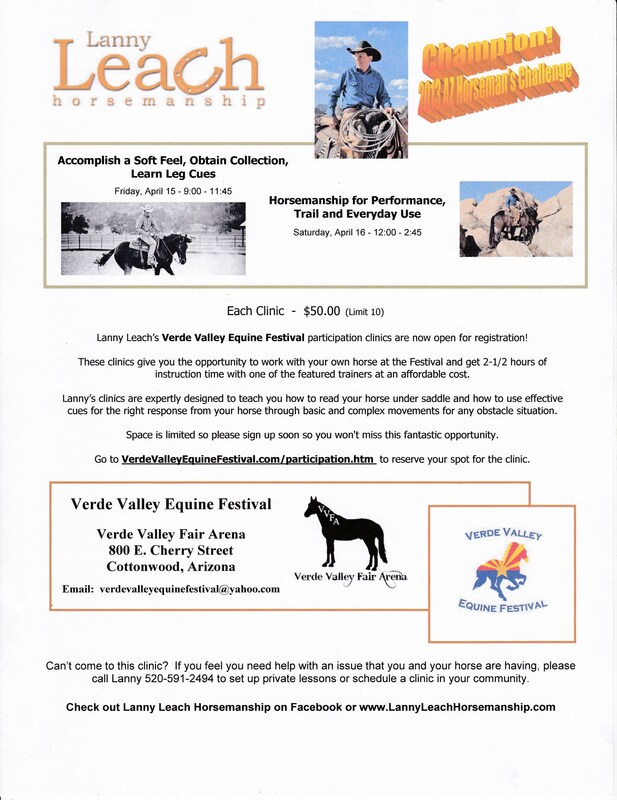 See Lanny Leach Horsemanship on or visit the Verde Valley Equine Festival for details. 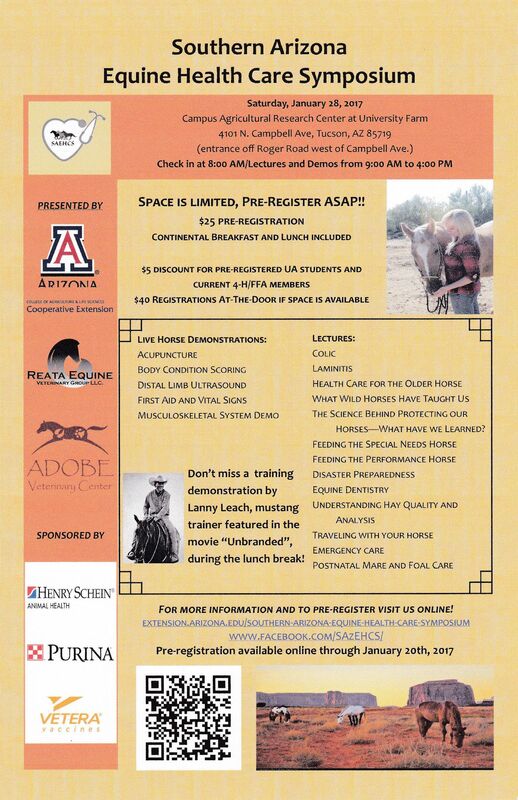 January 28 - Southern Arizona Equine Health Care Symposium, University of Arizona Campus Agricultural Center, 4101 N. Campbell Avenue, Tucson, AZ. Lanny will give a demonstration on Mustang training. See the flyer HERE. April 15 to 17 - Verde Valley Horse Festival, Cottonwood, AZ. Lanny will be a clinician offering two clinics. Friday, April 15, 9:00 -11:45, "Accomplish a Soft Feel, Obtain Collection, Learn Leg Cues," and Saturday, april 16, 12:00 - 2:45, "Horsemanship for Performance, Trail and Everyday Use." See Lanny Leach Horsemanship on or visit the Verde Valley Equine Festival for details. 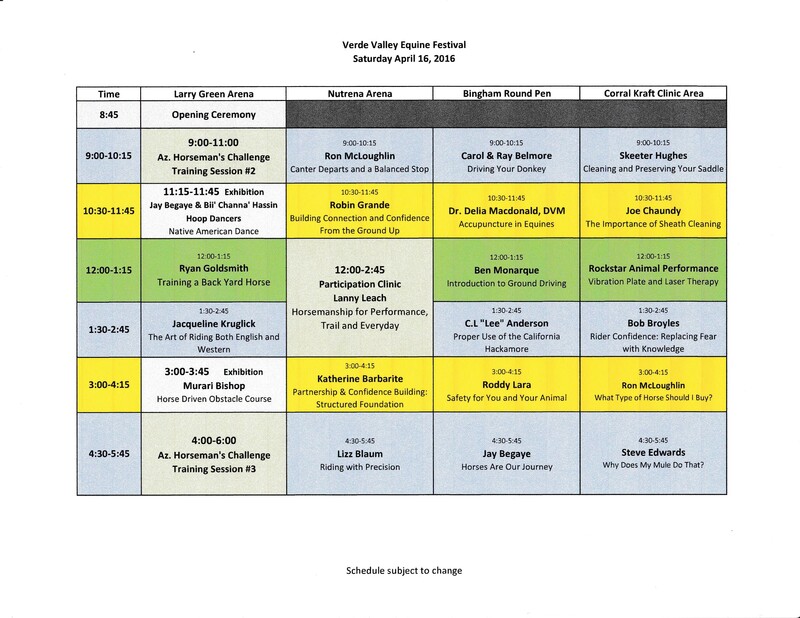 See Lanny's clinic flyer HERE. 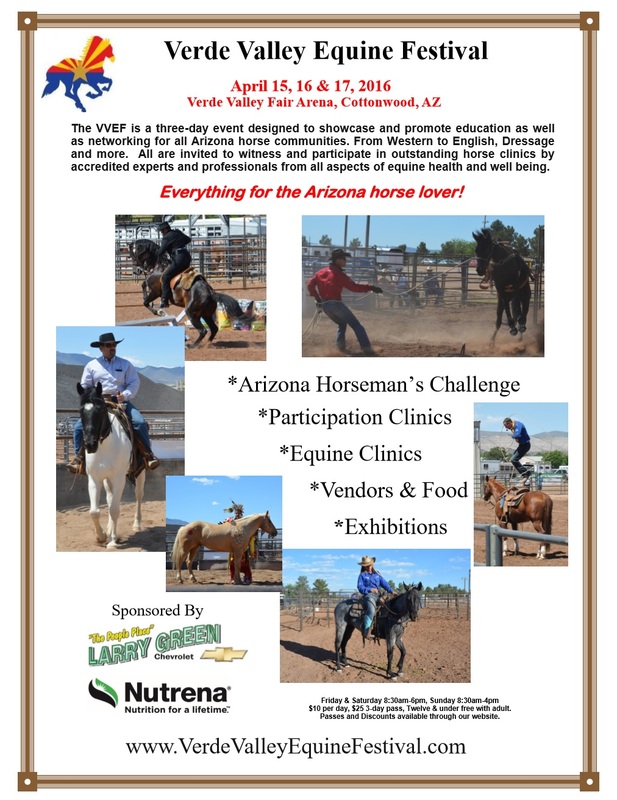 Verde Valley Equine Festival flyer is HERE. 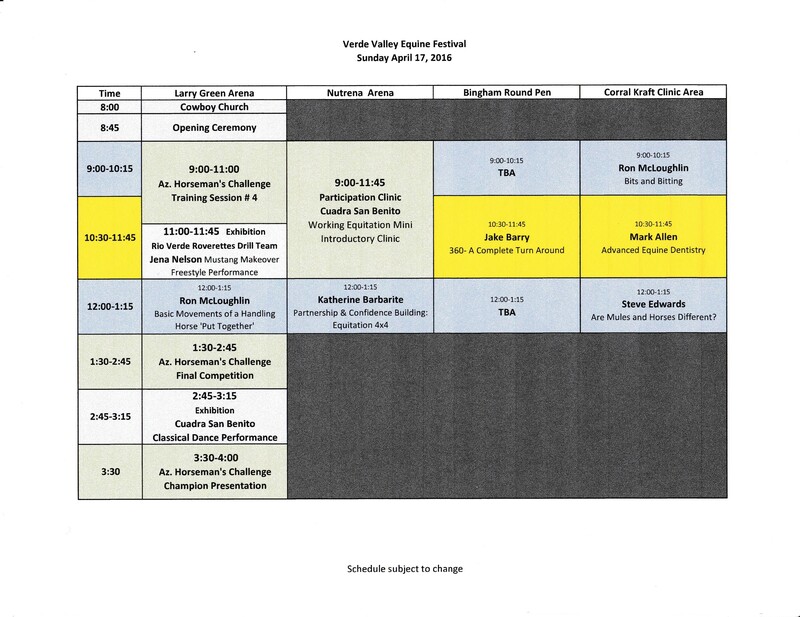 Also check out the Schedule of Events FRIDAY SATURDAY SUNDAY for the Festival. January 18 - April 30 - Lanny and Kathy will be at Montgomery Creek Ranch (MCR) after Lanny accepted their offer to serve as MCR's training advisor. MCR owns nearly 200 wild horses that were purchased at auction to rescue them from slaughter. Lanny will establish formal training protocols at MCR's 2000-acre facility and be responsible for selecting and training the first 25-30 wild horses for eventual adoption. See Lanny Leach Horsemanship on or Montgomery Creek Ranch for details and lots of photos! December 6 - 8 - Lanny will join seven other top trainers at the Las Vegas Convention Center at the Wrangler Arnea in Las Vegas, NV. These trainers competed in colt starting events all over the United States to qualify as finalists for this exciting event in Las Vegas. They will gentle, start, and ride eight colts which have never been saddled, bridled or ridden. November 15-16 - At the Bar J Horse Boarding arena, 3905 S. Broken Arrow Drive, Silver City, NM. Lanny will conduct a Practical Horsemanship for Trail Obstacles Saturday and Sunday from 9:00 a.m. to 4:00 p.m. The clinic is designed to teach you how to develop the confidence it takes to ask your horse to move calmly through, over and around obstacles. Lanny will also be available for private lessons at the Bar J on November 14. For more details see the clinic flyer HERE. October 2 - At Rex Allen Days, Willcox, Arizona. 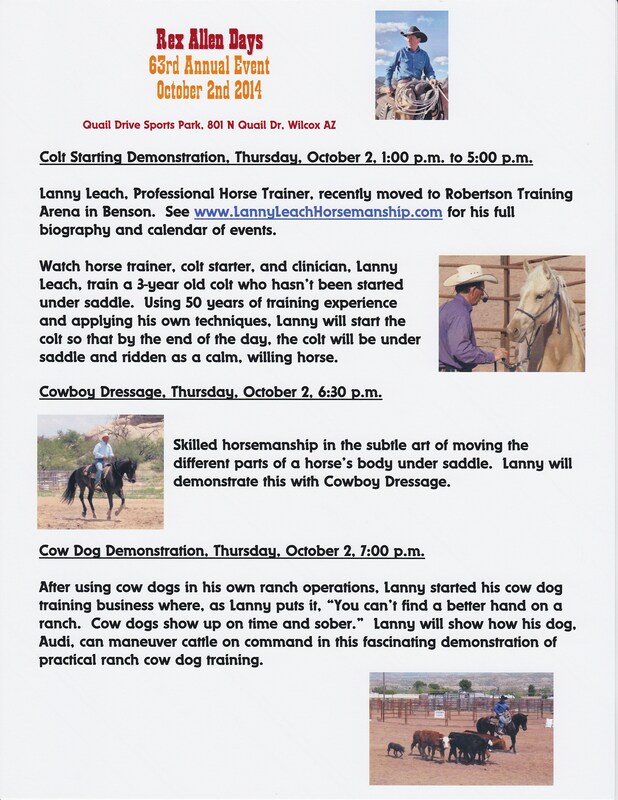 Lanny will conduct a Colt Starting Demonstration, a Cowboy Dressage Demonstration, and a Cow Dog Demonstration. For more details see the information flyer HERE. October 19 - At Diamond Lp Horses, 1250 Rockgate Road, Bartonville, Texas. 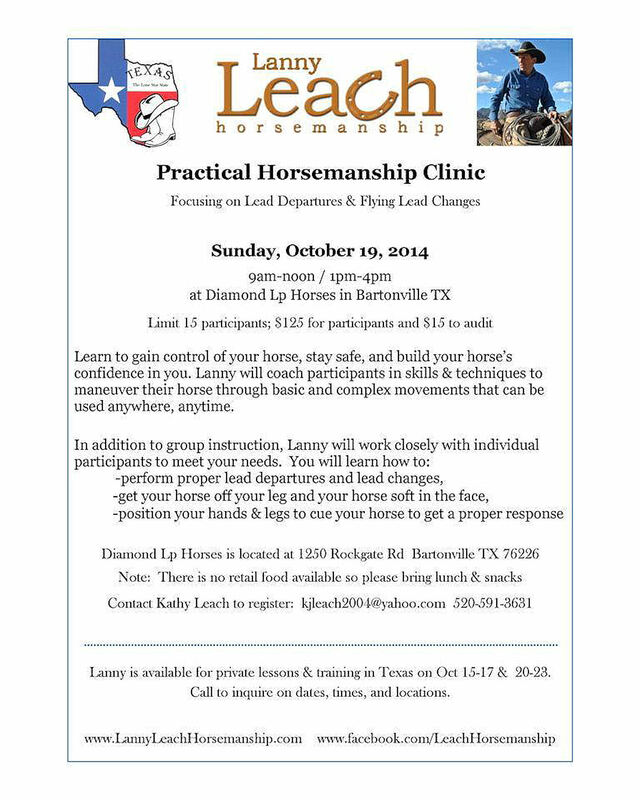 Lanny will conduct a Practical Horsemanship Clinic from 9:00 a.m. to 4:00 p.m. The clinic is designed to teach you how to gain control of your horse, stay safe, and build your horse's confidence in you. Lanny will also be available for private lessons in Texas on October 15th to the 17th and October 20th to the 23rd. For more details see the clinic flyer HERE. August 16 - 17 - At the beautiful Orme School Summer Camp founded in 1929 in Mayer, Arizona (I-17, Exit 268). Lanny will conduct a Practical Horsemanship and Cattle Work Clinic Saturday and Sunday from 9:00 a.m. to 4:00 p.m. The clinic is designed to teach you how to read your horse under saddle and how to use effective cues for the right response from your horse. 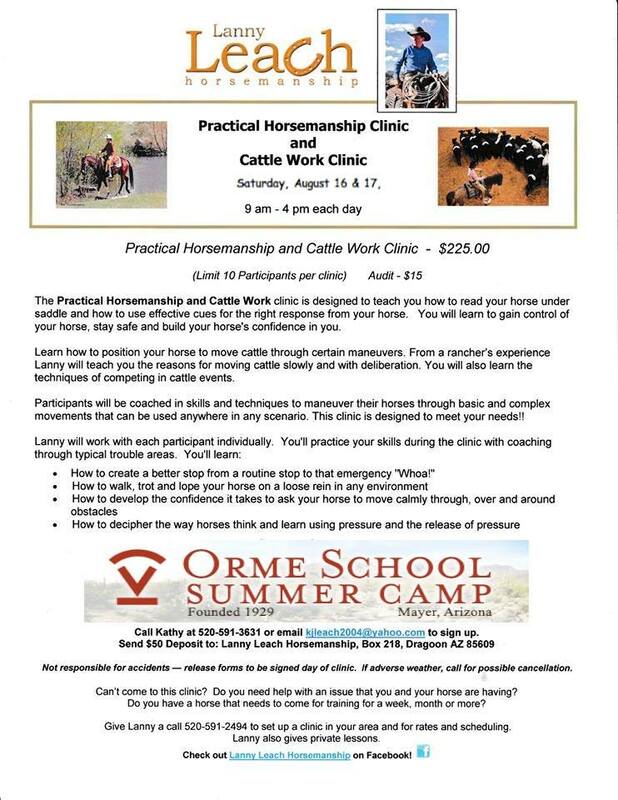 In the Cattle Work Clinic Lanny will teach you how to position your horse to move cattle through certain maneuvers explaining the reasons for moving cattle slowly and with deliberation. For more details see the clinic flyer HERE.